The Wehrmacht-Exhibition, which was shown in eleven major cities between 1999 and 2004 and was visited by more than 500,000 attendants, challenged an established social taboo. Up to that point, the image of the 'morally proper' German forces had been kept up in the public debate in Germany. Suddenly, there were photos of Wehrmacht officers killing civilians. The nation was severely shaken. 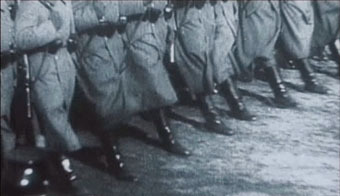 Any participation of the German forces in Nazi crimes was unbearable to the people in post-war Germany, so it continued to be publicly denied. Michael Verhoeven has traced some of the crimes the Wehrmacht is alleged to have committed. And filmed in the places of terror in the Ukraine and White Russia.